In order to go on the Waiting List at Jojoba Hills RV Park, there are several items that I need to complete. 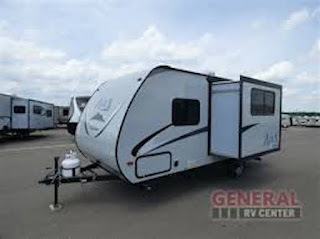 A Trailer RV, is the highest priority item. I've selected a 2017 Coachmen RV Apex Nano. An RV dealer located close to Guava Gardens has this trailer in stock. The plan is to inspect and likely buy it, next week. Would you like to read about this trailer? Click [here] for the web page! Today, the Jojoba Hills SKP RV Park has a member meeting at 4pm. A fun thing happens before! We all get served an Ice Cream float. Mine was a root beer float. What a good time 😎! My float was $free because I'm a guest at the park. Why am I getting a new electric bike? There is a "getting worse" problem for me with Mariner 7. In order to mount Mariner 7, I must swing my leg over the rear wheel. This maneuver has been getting a bit dangerous for me lately. A combination of less balance ability and pain in my right hip joint are the reason. I want to get an electric bike that has a "full pass thru" for my right foot. Such a bike will make bike riding for me a LOT safer. After the Ice Cream Float and the Member meeting, I was enjoying a shaded place at the swimming pool. A married couple came by, and we began to chat. The husband was interested in my electric bike. I gave him the bike's keys, and he went off on a ride. When he came back, I asked how he liked it. I believe this fellow might be buying my bike! During the 5 O'clock hour, every afternoon, is my time to soak in the hot tub. Back at Guava Gardens, my tub time was in the 7 O'clock hour. Here at Jojoba Hills [pronounced 'hohobah'], sunset comes about 7:15pm. If I did the spa here in the 7 O'clock hour, I'd be returning to Site 224 in the dark. Not a good thing for me with my balance issues. 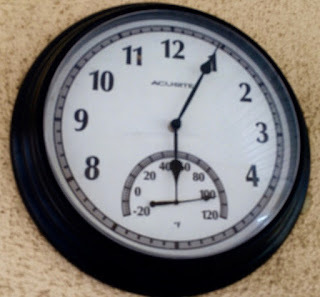 On the spa wall here, is a clock with a thermometer. Ms iP5 captured a pic of that clock and she told me, look at the temperature! PS: Ms iP5 is our team's iPhone. She's a Model #5s. George. Sure looks like fun. A couple thoughts. Have you thought of an older model ...a 2016? Or a used one? Barely used. Also as I looked at the floor plan I think you might get the feeling you are camping instead of living in your home. No place to enjoy company except at the dining room table. No comfy chairs. Where do you relax? T.v.? Maybe a bit larger and older more bang for your buck! Best to you. Of course you are correct. A trailer this size would not be comfy for most RVers. Not to live in full time, anyway. This trailer has pretty much the same area inside that my MsTioga had. So, I feel that this trailer would do a good job for me. And be a good fit! Gosh, the new adventures of Nano George! I agree with Dirk Digler. I don't believe that you will be comfortable in that small of a trailer. Because of your name. At first I was inclined to believe that your comment was a cyber kind. Trying to mess with the minds of readers. I have had that nickname for over 50 years. It was given to me by my fellow hams (amateur radio), since my call sigh is wb3dzy, the last three letters "dzy" is where the name Dizzy comes from. Why don't you visit my blog at Dizzy's Wanderings & Wonderings? I am an RVer with a diesel pusher but started out in a pop-up tent camper then a bumper pull trailer, then a class-C motorhome, and now the diesel pusher. Guava Gardens, in my opinion, is a swell place to live. And there are very nice ladies and gentlemen living there. I don't have any problem living in my van.So that trailer looks like a mansion, to me. Part of this lifestyle is all about spending most of your time outdoors, with guests or without. I like the trailer, a lot. But I'd want to shop around just a little bit more. Yes! I gotta shop around a little bit more. George, do you think you need to have room for an "easy chair"? Maybe look at some more floor plans - so easy to do on line. wishing you the best with a new adventure. I looked at more floor plans. I desire a trailer that has space for my La-Z-Boy recliner. But not too large a trailer. Please see my answer to your remark about my comment. Thank you, Dizzy, for getting my thinking straight about your name. Thank you sooooo much for your thinking about this dilemma. I think Barbara may well be onto something with the slightly larger 5th wheel. George, if you are going to remove the table where will you prepare your food? There is no counter space that I can see. BTW, congratulations! I was so sad when you had your wreck and no longer were in an rv. I know it's going to be parked and not moved I guess but still, you will be in an rv and if you really want it moved to another location you can always hire someone to move it.